Aerial view of Hi`iaka pit crater on the east rift zone of Kilauea Volcano, Hawai`i. 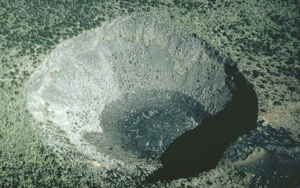 The floor of the crater is covered by solidified lava that poured into the crater from the lower right (note black lava flow at crater rim). Pit craters are circular-shaped craters formed by the sinking or collapse of the ground. Fissures may erupt from the walls or base of a pit crater, but pit craters are not constructional features built by eruptions of lava or tephra. Pit craters may also partially fill with lava to form a lava lake. They are common along rift zones of shield volcanoes; for example, Mauna Loa and Kilauea volcanoes in Hawai`i. No one has observed the formation of a large pit crater, but they are thought to form as a consequence of the removal of support by withdrawal of underlying magma.